I’m talking about the world of bodybuilding. To some, the sight of a massive muscled ripped individual is repulsive. To others it is a thing to behold. I am in the latter category. Just to make it clear that I am not talking about sexual muscle worship here but an admiration and respect for the time, dedication and effort involved in attaining a physique that most people will never ever get anywhere near, myself included. For any of you that have ever seen the film Pumping Iron you will know what I mean. 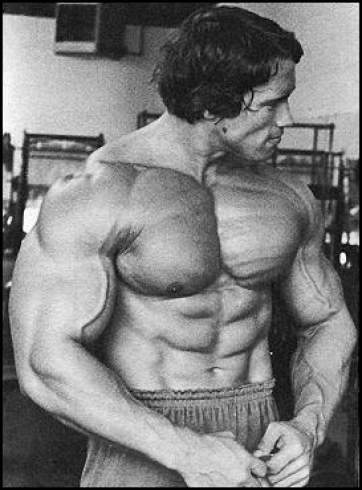 The perfect symmetry of someone like Arnold Schwarzenegger or Frank Zane at their peak was and still is hard to better. The bodybuilders of today are just too big to be appreciated by the general public. Someone like Zane or Arnold could be admired as having a physique people could aspire to but the likes of Ronnie Coleman and Jay Cutler, while being huge and ripped, are just too freaky to be envied by the average man in the street. I train myself and would love to achieve a physique along the lines of Zane but too big is too much and that’s it. I was fortunate in realising a few years ago that the mens muscle mags published by big companies such as weider amongst others are far away from telling the truth about results attainable by the readers of the publications. The mags contain workouts claiming to give you bigger arms, a bigger chest, bigger legs, lower body fat and all in six weeks or maybe ten. When you browse the workout plans they would wipeout an average gym member and probably some experienced athletes as well. This is not very fair to the little guy who wants to be bigger or ripped. He will try to perform the exercises and most likely end up with at least one injury and a very sore body. The obvious money spinner in magazines is advertising for supplement companies. While a straight forward protein powder based drink is definitely an advantage to someone trying to add lean muscle mass, are they really in need of a product loaded with creatine, protein blends, sugar, vitamins, minerals, more sugar and probably a good helping of dextrose “filler”. I see young guys at the gym performing some very strange exercises which can only have come from something like mens health, loaded or another publication. I can see them now, doing bicep curls at 90 mph, well half bicep curls actually because everybody knows you don’t have straighten your arm when doing curls? It would be good to see a magazine that just tells it like it is. If you are going to weight train, do some research about nutrition and exercise. Learn a little about your body and how muscles respond to weight lifting. Workout a plan with a qualified instructor at your gym and get in there and train. Take it easy at first and your strength and mass will increase. Eat well, eat good food and by all means take a simple whey protein based drink if you want. Get lots of sleep and repeat. Start with 3 workouts a week to start. You can always increase to four if you want later. This was a really good article. I feel the same way about these magazines. I am subscribed to Men’s Health. I have tried some of the exercises and I find I can’t get half way through them. You have some very good points. not being disrespectfull but in order to get big or improve your physique u need to train like an animal and train harder than you usually couls. i admit that the 6 to 10 week time period is a load of bull unlees ur an experienced athlete etc. but if u eva actually heard what arnold said in his movie pumping iron. he said that i throw up and pass out many times in the gym, but i dont care cause its all worth it. i have no fear of fainting becasue i just go in and i dont care. i just gota haqve the guts to whats nessisary. i’m sick and tired of hering people who dont have the tenasity talk about ways to help the average man get in shape and have a nice physique. Let me make this clear. ( IN ORDER TO CHANGE ONES PHYSIQUE AND GET STRONGER ONE MUST TRAIN WITH FEROCIOUS INTENSITY ) and by that i mean to the point of collapse and exaustion. now obviously your average joe wont be able to handel what the mags point out to do. but dont freat do what u can to YOUR MAX and u will eventually build strength etc in order to do those crazy workouts. My best whishes and blessing to those who have the guts to train as though there life depended on it. Sir, I have to agree with your views on bodybuilding. The mid 60’s to the late 70’s were the years of awesome bodybuilders. Ever since that time guys like Ronie Coleman, Jay Cutler, Johnie Jackson, Gustavo Badell, and Ronnie Rockel are simply just too big. Bdybuilding was originally a quest for the best athletically shaped man. As it grew it became a constant challenege to develope a perfect muscularity. Todays challengers and judges alike have forgoten the true definition of beauty of the human body and its delopment. Symmetry and porportional size needs to be of more emphasis..not just freaky size…don’t get me wrong, cuz size is great but there’s a point when too big is simply TOO big. I’m an aspiring bodybuilder myself and I just love being in the weight room. My mom always said give it your all or don’t bother trying. THat’s my phillosophy when i hit the weights. THis has gotten me quite a ways but smarts have also helped alot too. I get all the info i can from books and magazies with interviews on Arnold Shwarzenegger. I mean after all, he is the best ever – no contest! Grow Big 🙂 but not too big. No need to take things…its only going to put water into your body giving you the bloated soft look….you want a hard riped looking body…it doesnt matter how many times u fall…it matters how many times u keep trying and get back at bodybuilding and go harder….and remeber…it TAKES TIME! to get the PERFECT BODY. I am wondering where you got that picture of Arnold? It is a classic photo and I have been looking for a good black and white 8×10 to add to my collection. I have been searching everywhere on the internet for somewhere to buy the photo you have posted. Can you email me and point me in the right direction? Much appreciated. Yep, all sounds good and such, but i could care less anymore. I dont know a damn thing about body lifting, but i do know what it feels like to take it to the limit… If they tell you there is such thing as a limit and you go with it, i can guarantee youve already lossed, just another fool caught up with yourself… I dont like bragging, but i just turned 18, and i look better then most body builders… If you think your going to somehow find this hidden strength and such from nothing, then good luck, i know mine comes from a strong line of highland Scots and Irish Genes, that doesnt make me elite at all, but i know that it has to do with alot of this “natural” strength or tone everyone seems to want to be going for… Now I’m not saying leap for the nearest steroids you can get your hands on and pump up to turn into a monster, you just want a nice build with broad shoulders, large wings, and tree trunks for legs… if you want it that bad, then work with it. Be honest with yourself, how often do you exercise and for how long, and how hard? Seriously… take it easy, work out once or twice a day, hell work through out the day using push-ups and sit-ups, jog here and there through the week atleast a half mile, then begin increasing. If you dont think it works, your not even trying… If you actually stick with it for a long period of time youll have a body you can admire without over-doing it… And always remember, it’s better to run with your skirt up, than your pants down, next time you try making fun of the kilt : P.
The classic bodybuilders of Arnold’s era were the best. Back then bodybuilders were physically something to look up to. Unfortunately today most people wouldn’t want to look like a professional bodybuilder. sir,please tell me best wight gainer. and tell best diet chart. beacuse i become a new bodybullder. I know the articles in all those mags have a commercial side to it. al that the big companies think about is profit. The averige joe won’t ever reach the likes of a pro bodybuilder. Because it’s real commitment doing what they do. So if you have a job sitting at a desk you wil have to accept that you can’t reach the ultimate bodybuilding level but you can stay healthy. So do your job, get some exercise, have some fun, and be sure to rest or els you won’t be able to do any thing. l m for India and i m workin on ship in Italy , i m workin for night shift for 12 hour , when i get up i drink black tea after few hour i have my dinner afert few hour i have cornflake after sometime i have with something then finish my duty then i drink. We done have big cabin also we done have gyum i like 2do so work out but i feel bore & i have forget my work out from last6yr sometime i get back pain,also i feel weak , my tamy is big as per my body ,i mostly reduce eating so my tamy should not come out no drinkin beer ,or coke but i have hard drink like vodka with orange & somkin alot u will think what i have write but i m so sorry for that&this is my first letter. Only one word i want to say about arnold that incredible, unbelievable. I think only god can make himself as him. Ive been exercising for along time, but I just joined a new gym with a trainer. But he only has me working out four days a week for an hour a day alternating upper body one day and lower body one day. I want to trust him because he is in the hall of fame for power lifting but it sounds like its not enough. Is that enough to gain a amazing physique and amount of strength. pls give me tips with strong mussal boddy . interesting article. although i have to disagree with one of your points about taking supplemements. i have a good physique, and know i wouldnt be close to where im at if it wasnt for some of the supplements that I’ve taken. thats not to say i’m speaking of anything illegal, but prohormones, creatine, and of course powdered protein are VERY helpful, and helped me build confidence when i hit a weight lifting plateau. 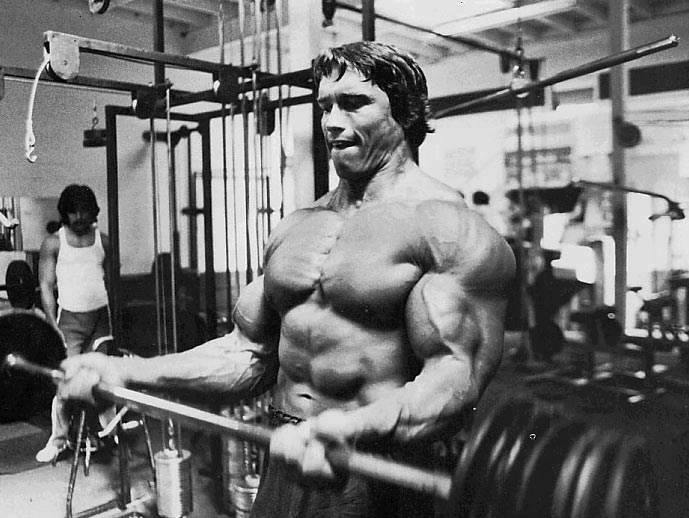 arnold is the greatest, and what has he admitted to taking during his bodybuilding career? A great body building & bright poses. I too, indulge in body building & will i welcome the few more tips on the concerned matter for my own development.